The work is moving crazy fast here in Hermiston. 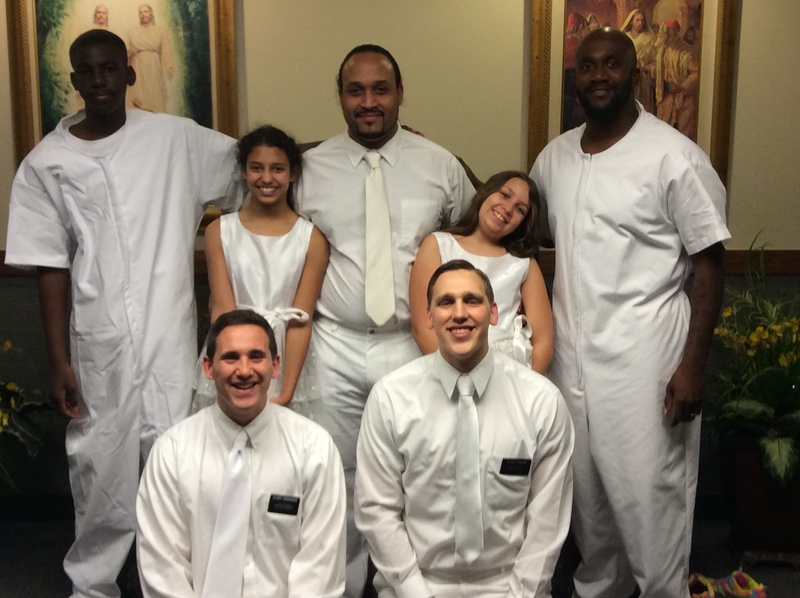 We had another baptism this weekend. Kathy was baptized. 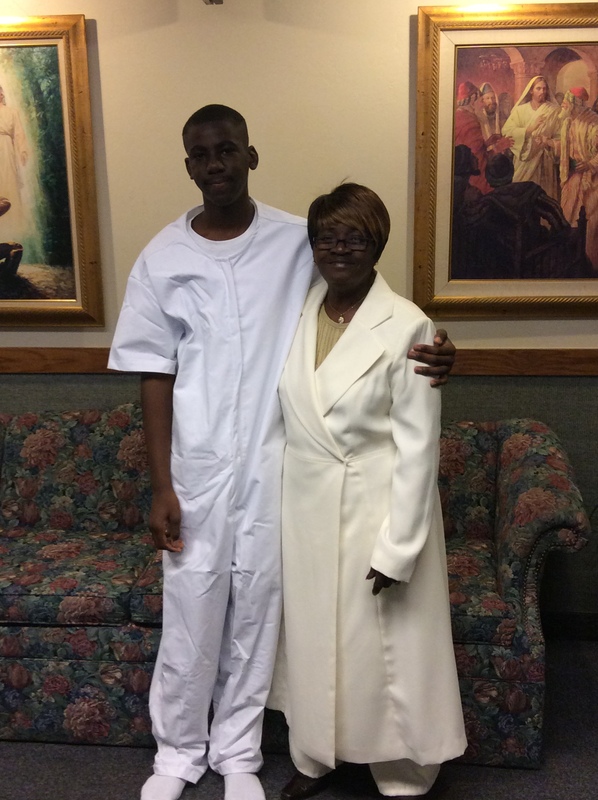 What a wonderful day that was to see her so happy for making the decision to come and follow Jesus Christ. We are watching every day as the people that we are teaching are making the steps needed to gain the conversion to the truth of this message. I have seen an increase in the faith of our investigators since the fast that we had for them. It is great to see them all be willing to make the steps that they need to make to gain the knowledge from god that this is true. Faith is such an amazing power that cant be put into words, but I know it works. God is there and wants us to believe in Him so that he can use that power of faith to bless our lives, so when others are doing that and experiencing the truth of it all IT IS A MIRACLE. We have so much that is going well, we are teaching everyone as often as they will let us. Abel and Kristina are letting us meet with them EVERYDAY. They came to church and brought all the kids. What a wonderful family! 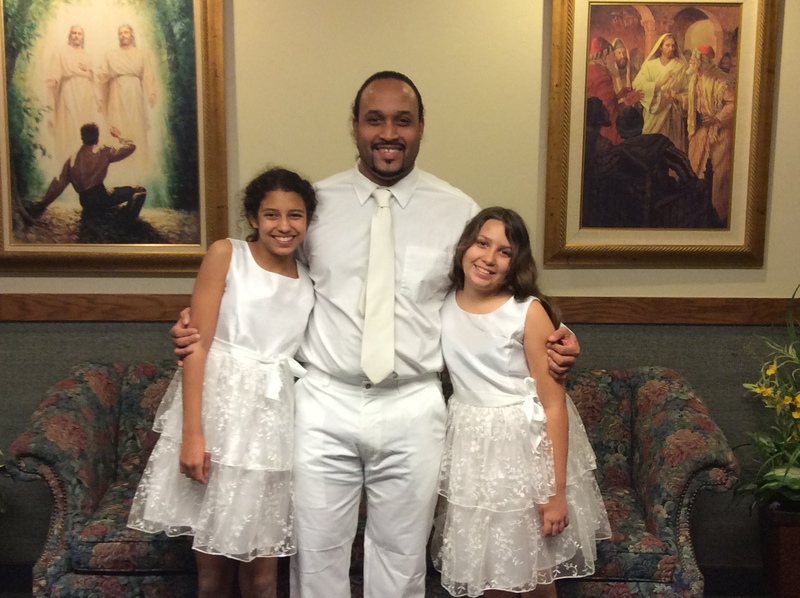 We are excited for their baptisms in July, they are praying and working towards that date. So Transfers have come and gone. I am staying here and so is my comp. Which means that we are staying in the Kennewick Washington Mission. And This will be at least 4 1/2 months in Hermiston I love the people that are here and everyone that I am around. I am very excited for the next 6 Weeks!! Well a lot of stuff went down last week we got a referral and it turned out to be Elder Wongs mom’s cousin and well she recognized him right away and it turns out she is a lost sheep from about 20 years back. She was anti’d by her family really bad and then went less active then fell off the radar and after having an amazing visit with her, she referred us to a bunch of others and I was very happy but even more than me elder wong is very happy because these are all his family! So we got the go from President Hawks and started working on them! Well last night we had to head to Wanchai to do our turn at this welcome center thing the church is trying here (its like a visiting center). Well right when we were wrapping up we went and got some dinner and then we get a call from the zone leaders saying Elder Wong will be leaving to Macau!! This is crazy we have only been together 3 weeks and something must have happened because its only our companionship and the Macau companionship that are affected. I was pretty happy for Elder Wong but he was not to happy because we just found all his family and he is really the key to it all working out. Well we forgot something at the church so we had to head back and as we walked down some stairs we ran into President and Sister Hawks just before they walked into the Elevator so we talked for a minute then I informed them that Elder Wong got the news and President asked him how he was feeling about it. Well Elder Wong was not gonna say he was not happy but you could tell he wasn’t too pleased to be leaving. Well we scheduled an appointment with his aunt so he could get a goodbye before he headed out and so hopefully I could get to know her better. Well when we were talking with her. We got a call from President and he asked what we were doing and we said we were in a lesson so he said okay I will call you back but when I call you don’t answer the phone (a little weird). Well he called and elder wong answered the phone anyway then president said I thought I told you not to answer the phone, but I am glad you did because I had the right companionship but the wrong Elder, Elder Cordon will be packing his bags. We’ll it was Ironic because when Elder wong was talking to president I was talking to his aunt telling her how I would love to switch Elder Wong places then he hangs up comes and grabs my shoulder and says well thats what just happened. I was very very surprised because I thought I had no hope in going to macau. Only the Uk and Locals get to go there, but sure enough I am going so it won’t be for more than 2 months but its happening! So I am staying in my area I am with the same companion which means that we can keep our momentum going. I love this area and it is so very beautiful. I love the wonderful blessings that are pouring out as we are moving forward in faith. Seth and Liz had their baby blessed this weekend and Monty and Deedee are still doing awesome. They are studying for an hour every morning. WOW They are such examples of what it takes to get asnswers from the spirit. I love that I am able to be on the mission and see the miracles and be an instrument in Gods hands. We are also teaching this wonderful girl of a family it is the oldest daughter of this young family. She is 11 and has been going with her grandmother to church for many years and she wants to get baptized so we set a goal of march 14. We are hoping that bring the lessons into her home will also invole more of the family with her. I am in a new area, with a new companion, and a whole new set of challenges. I am so excited for this transfer and everything that it has to offer. There is a lot of people here that are seeking after truth and are ready to make changes in their life to come closer to Christ. I love the people that I meet, what an amazing knowledge that we have to know that we are all children of our Heavenly Father and brothers and sisters in his family. It really brings it into perspective of why we share this gospel. I have been sent to Wenatchee WA. what a beautiful area this is and I my even be here for Christmas, which would be just great. We already have snow capped mountains. SO BEAUTIFUL. Gods creation of this world is such a wonderful gift I am glad that we have beauty in this world that we can fill our surroundings with. Sorry I was silent last week, the pictures are of what I was doing instead of emailing. I hope that you agree it was time well spent, and if you don’t well too bad it already happened. St. Augustine is a really cool city. 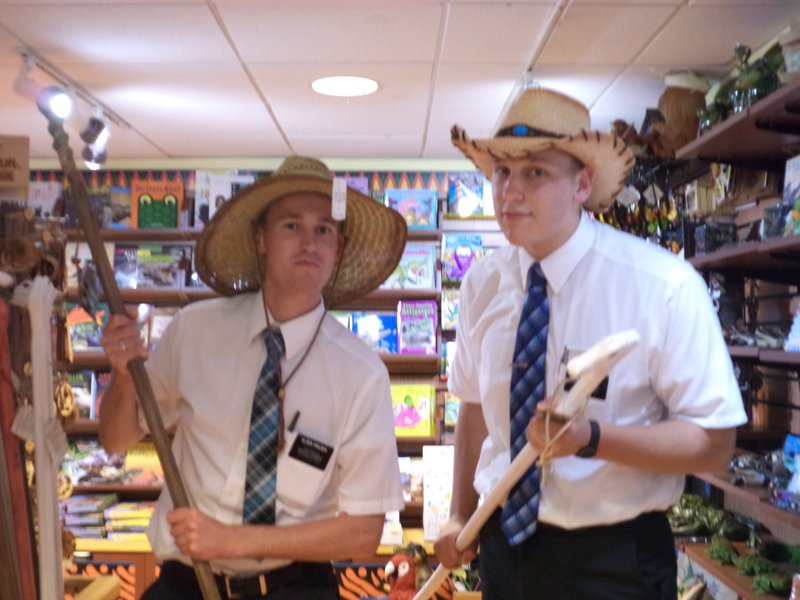 It has some really neat attractions, definitely some of the coolest stuff I have ever seen on my mission. 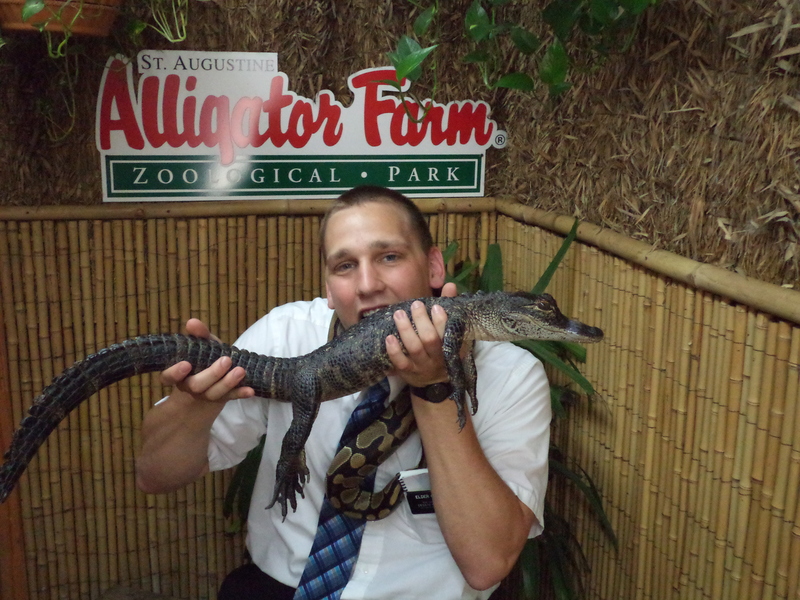 I got two items checked off of my bucket list, I saw huge gator, and I held one. Next task is to find one in the wild and poke it with a stick. A really long stick mind you. Okee Fanokee Swamp here I come! haha oh man that would be cool. Along with seeing the gator farm we got to see the Fort they had there and it was really cool. It was definitely a lot bigger than I thought it would be looking from the outside. Needless to say it was a really awesome trip! It all could not have happened without Elder and Sister Christensen though, they help finance all us poor missionaries and made the itinerary. I am very thankful for kind people like them! Another interesting thing that happened this past week was that Elder Frazier went to the temple and I was in a trio for the day. It was an interesting experience. Luckily I got to pick were we go for the day, so I was able to stay in my area and keep the work moving along. Both of the Elders I was with are in full bike areas so they appreciated the break. 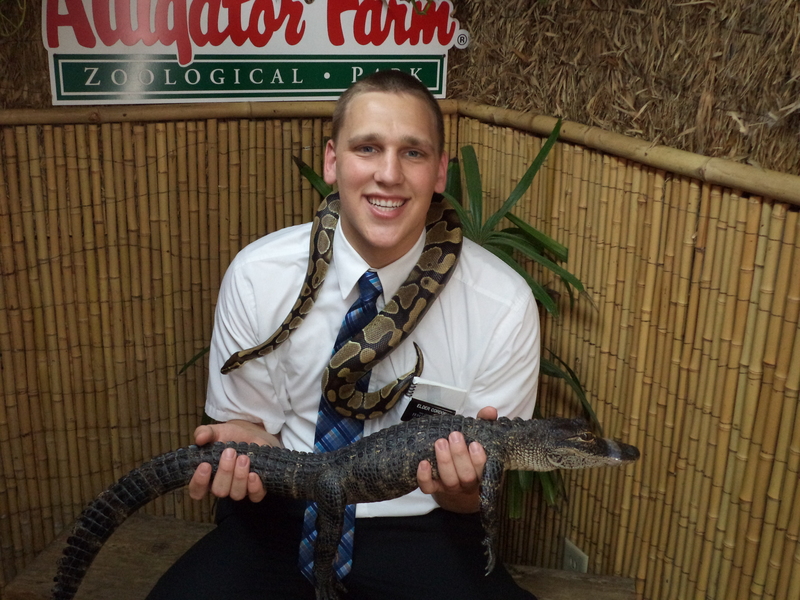 Exchanges are nice because they mix up the monotony and you learn so much from serving with other missionaries. We got a call from President Craig yesterday and Kevin and Lori can get baptized this week so that is incredibly exciting! Also, we had transfer calls last night and every companionship of elders in the zone got changed except for us, and all the sisters in my district got changed, and 2 sisters in the other district. It was a massive change that I did not see coming! That just means that I get to build a friendship with a lot more missionaries though which is very exciting! Wohoo! Friends!